Shinoda Tōkō (Japanese, born Manchuria, 1913), Quiescence, ca. 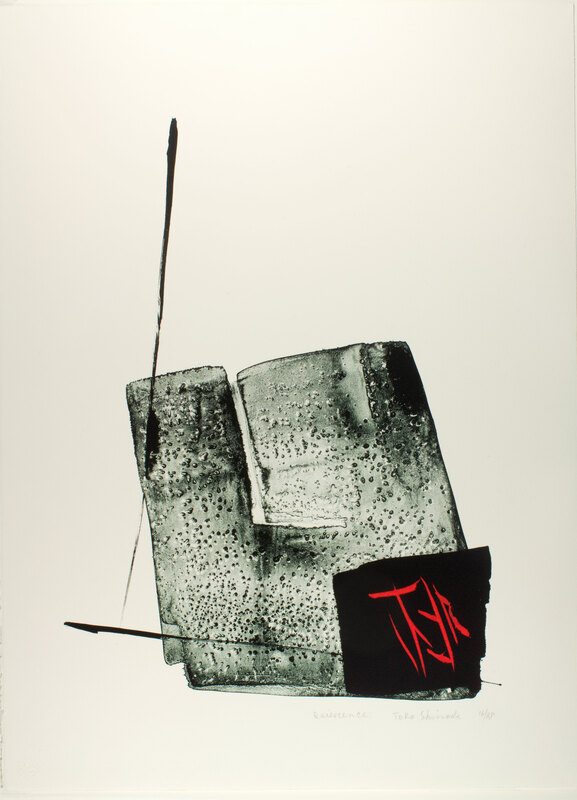 1980, Lithograph and calligraphic brushstrokes on paper, Museum purchase: Funds provided by Travers Hill Polak. For centuries, women were excluded from printmaking in Japan. Circumstances began to change only after World War II (1939–1945), in the context of much larger social transformations. This exhibition focuses on the work of five exceptional women who were pioneers of printmaking in the postwar decades. Today, all five artists enjoy international renown. Collectively, their work displays a dazzling diversity of stylistic choices, all markedly different from that of their male counterparts. Significantly, interaction with the West played a crucial part in shaping each artist’s individual voice. Minami Keiko (1911–2004) took up aquatint etching in Paris, where she had moved in 1954 with her husband, mezzotint artist Hamaguchi Yōzō. Her images of young girls, trees, and birds, limned with disciplined, almost obsessively detailed linework, evoke a haunting, fairytale world. Shinoda Tōkō (born 1913) had an established career in Japan as an avant-garde calligrapher by 1940. Two momentous years in New York in the mid-1950s exposed her to the Abstract Expressionists, whose work resonated with her own artistic goals. Shinoda works in lithography, a printmaking technique that is uniquely suited to capturing the fluid movement of her brushstrokes. Yoshida Chizuko (born 1924), an oil painter, began printmaking after meeting and marrying Yoshida Hodaka (1926–1995). The couple traveled abroad often, and Chizuko often drew inspiration for her art from what they had seen and experienced. An artist of relentless perseverance, she has experimented with several different techniques and styles over the course of her career. Matsubara Naoko (born 1937) studied printmaking at Kyoto City University of Arts, where she learned to carve directly on woodblocks, without the intermediate step of a drawing. She still uses this technique, which imparts a forceful immediacy to her works. Matsubara has lived and worked in North America since 1961. Oda Mayumi (born 1941) graduated from Tokyo University of Fine Arts in 1966. She came to the United States soon afterwards and has remained here ever since. Equal parts earth mother, political activist, and Zen Buddhist, Oda is the sole artist in this group to work in screenprinting—a stencil-based technique that is ideal for her playful, dynamic style. Breaking Barriers is drawn both from Museum holdings and loans from many individuals. The Museum is grateful to Ren Brown, Joann and Ed Frankel, Matsubara Naoko, Ellen and Edwin Reingold, Peter Shinbach, and Yoshida Chizuko for generously sharing their collections with the public on this occasion. Organized by the Portland Art Museum and curated by Maribeth Graybill, Ph.D., The Arlene and Harold Schnitzer Curator of Asian Art, with the assistance of Irwin Lavenberg, research volunteer for Japanese prints. This exhibition is supported in part by the generous support of Exhibition Series Sponsors.